Lake Harding (also known as Bartlett's Ferry) is located on the Chattahoochee River 15 miles north of Columbus, and is part of Georgia Power's Chattahoochee Hydroelectric Group of lakes that also include: North Highland, Lagdale, Riverview, Goat Rock and Oliver. Constructed in 1926, Georgia Power operates this 5,850 acre reservoir on the Chattahoochee River above Lake Goat Rock. Lake Harding forms the boundary between Alabama and Georgia for 12 miles. The lake is fed by Flat Shoal, Blanton, Sand, Oak Mountain, Halawakee, and Osanippa creeks. There are many islands on the lake, Great island is the largest. Tom Houston Island (aka Kudzu or Chimney Island) is also worth noting. It is distinguished by an old chimney which is the only remnant of Tom Houston's home on the island. Water Level: Average water level variance? 6-18 in. Building restrictions: Must be approved by Georgia Power. Lake Harding has good populations of largemouth and spotted bass, as well as hybrids, crappie, cats and bream. Bartlett's Ferry has many boat docks and piers that provide good structure to attract fish. This lake has excellent bass fishing. Largemouth bass have been abundant for several years. On the average about half the largemouths are greater than 12 inches. The largemouth you catch should weigh about 1-12 lbs. Boat docks and fishing piers are favorite spots for bass anglers, but do not overlook rocky points and underwater humps. The peak fishing time for largemouth bass is March through May when water temperatures are in the mid-to-high 60s. For every 10 largemouth bass there are three or four spotted bass. The average-sized spot will be 10 inches and weigh about : lb. Since there is no minimum size restriction on spots, fish of this size can be legally harvested. Spots tend to bite during the same time as largemouths, but generally they are found on rocky points and in deeper water. This lake is not known for bream fishing. Most bluegill catches will be 6 inches or less and weigh 2-3 oz. On the other hand, redear sunfish grow larger and give anglers catches better than 3 lb. Both species are caught around docks and piers and most frequently during the summer months. Fishing for white bass and hybrid bass has been good to outstanding for several years. Hybrids have survived well in the lake and it has been reported that trophy-sized individuals up to 14 lbs have been taken. Hybrids have not been stocked in Bartlett's Ferry since 1995, but are still abundant throughout the reservoir. Most of the hybrids in recent years have likely traveled downstream from West Point Reservoir where they were stocked. Catches will average two to 3 lbs, but larger fish up to 8-10 lbs will be abundant for the avid hybrid angler. White bass should average 1 lb or better. Crappie enthusiasts are not usually disappointed on Bartlett's Ferry. Generally, about 50% or more of those crappie are 10-15 inches. In most years, the average size will vary from 2 lb. "Slabs" are abundant for the avid crappie angler. The best crappie fishing months are February through April and WRD's six buoyed fish attractors provide good fishing areas. Typically, fishing for catfish is good to excellent. Channel catfish are the most sought after species, but white catfish are plentiful. Catches of channel catfish up to 8-10 lbs are possible, but individuals averaging 2-3 lbs will be the norm. White catfish should average 1 lb. This lake is a good bet for catfish at anytime of the year. There are two boat ramps on the Georgia side. The DNR facility at Idle Hour Park has four lanes and paved parking, and is open year-round. Georgia Power Company's Blanton Creek Park (706-643-7737)also provides boating access, but is open from around March 31 until Labor Day only. Halawaka Campgrounds 8180 Lee Rd. 279 Valley, AL 36854 (334)749 4912 4 small cottages, 6 vehicle hookups, and primitive campsites. Fishing, water sports, boat launch, bait and tackle shop, picnic areas. Credit cards: none. Discounts: none. Located on Lake Harding. Exit 64 off I-85. The main Georgia Power recreation area on the Georgia side of the lake is Blanton Creek Park (706-643-7737). Shaded by tall stately pines, the full-service campground includes picnic areas, pavilions, a boat ramp and a playground. On the Alabama side of the reservoir are Chattahoochee Valley Park and Po-Boy Landing which offer boat launching and day use. 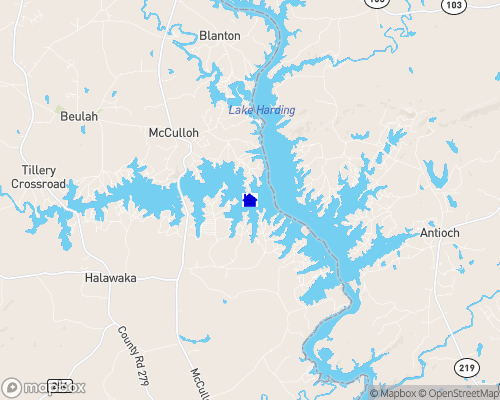 Lake Harding and other reservoirs along a 35 mile section of the Chattahoochee River offer many public recreation opportunities, including boating, skiing, fishing, swimming, sailing, camping and picnicking.